PESHAWAR, Sep 23 2011 (IPS) - With Pakistan’s Khyber Pakhtunkhwa province turning into the ‘polio capital of the world’, authorities are warning parents that heeding Taliban propaganda against oral polio vaccination (OPV) could earn them a prison sentence. “The problem of refusal has become serious and it has been decided to initiate action against the people involved in campaigning against OPV drives,” district coordination officer Siraj Ahmad Khan told IPS. Last year, Pakistan earned the status of the world’s worst polio-endemic country after 144 cases surfaced, 96 of them in Khyber Pakhtunkhwa and the adjacent Federally Administered Tribal Areas (FATA). The victims included 50 children who were not immunised due to parental objections. The administrations in these two territories, which border Afghanistan, will now follow a strategy of using religious leaders to persuade parents to cooperate on the one hand and using the force of the law on the other. The government showed it meant business by deporting the family of an Afghan child who tested positive on Sep. 7. “Afghan families staying in the province are spreading the virus,” Khan said. Afghanistan has problems very similar to that in the FATA and Khyber Pakhtunkhwa with Taliban militants in that country opposing OPV drives. An outbreak of polio in 2010 in the areas of Tajikistan along Afghanistan’s northern borders, which left 500 children paralysed, was seen as an example of how rapidly the virus spreads. 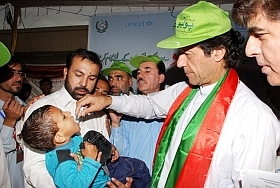 This year, Pakistan is once again leading the tally with 83 cases among the three top polio-endemic countries. Nigeria, which follows with 23 cases, and Afghanistan, with 12, are also influenced by religious beliefs against vaccination. Polio, which spreads in areas with poor sanitation, attacks the nervous system of children under the age of four, resulting in permanent paralysis of one or more limbs within hours of infection. Dr. Jan Baz Afridi, polio officer in Khyber Pakhtunkhwa, says that currently 16,000 children have not been administered OPV in the province due to refusal by parents. One strategy being adopted is to point out that the government of Saudi Arabia, a country which commands respect among the faithful, has made it compulsory for those undertaking the Haj pilgrimage to get vaccinated, even if they are older than five years of age. Further, some of the ulema (religious experts) were convinced enough to issue fatwas (religious edict) to say that OPV was not only safe but also the only way to save children from a crippling disease. Tackling refusals became a priority after Pakistan came under pressure from the United Nations and other donor agencies to ensure that the OPV drives succeeded, said Afridi. These agencies have been spending about five million dollars each year on the OPV drives as part of the Polio Eradication Initiative of the World Health Organisation (WHO) launched in 1994. The international programme suffered a setback in 2009 when the Taliban took control over the Swat valley of Khyber Pakhtunkhwa and used radio broadcasts to spread the idea that OPV caused infertility. “By giving OPV to the children we not only safeguard children against poliomyelitis but also stop circulation of the virus,” said Farooq, explaining the global strategy of inducing ‘herd immunity’ against the virus. “The fact that refusals are actually resulting in polio infections is proof for many that OPV is the only protection that the children get against polio,” Farooq said. Afridi said that the strategy of taking legal action and roping in religious leaders was already beginning to pay off as refusal cases have come down from 26,000 to 16,000 over the last six months. “We have also greatly strengthened our reporting system to ensure that every child is accounted for,” Afridi said.